JCCP updates aesthetic industry whilst coming under fire! In recent weeks there has been much debate in social media forums about the role and plans for the JCCP or Joint Council for Cosmetic Practitioners. In January 2016, the British College of Aesthetic Medicine (BCAM) and the British Association of Cosmetic Nurses (BACN) announced the formation of the JCCP. The JCCP would be a new non-mandatory, self-regulatory body providing oversight for the cosmetic medicine sector in England. The results of the HEE consultationexercise demonstrated overwhelming support for the establishment of a Joint Professional Council for the cosmetic industry. The creation of the JCCP is supported in principle by the Department of Health and Health Education England (HEE), and has since widened to include a working group with BAAPS, BAPRAS and BAD also on board. The long-term plans include the management of registers of JCCP registered practitioners, training bodies, training courses and premises. It also includes the formation of a Clinical Standards Authority (CSA) to set the standards of proficiency and practice for the non-surgical sector, building on the previous work undertaken by the HEE. The ownership of the qualification and training standards, formulated by the HEE, have now passed to the JCCP. They have the opportunity to amend them, if needed, prior to a final and formal publication, currently set for April 2017. 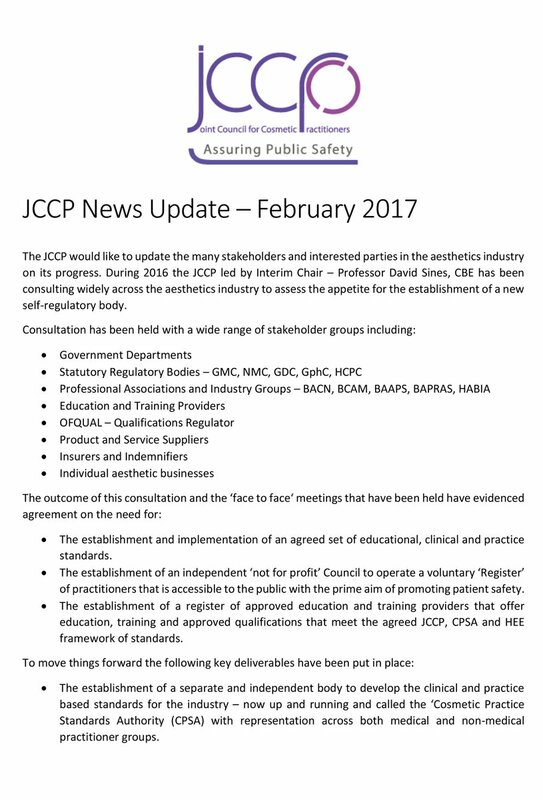 The Joint Council for Cosmetic Practitioners (JCCP) would like to update the many stakeholders and interested parties in the aesthetics industry on its progress. To do so they have issued a statement detailing progress to date, including the results of consultations, the agreed remit and deliverables required, as well as the progress of the establishment and management of a technology platform for the operational delivery of practitioner and training course registers where they are seeking expressions of interest. 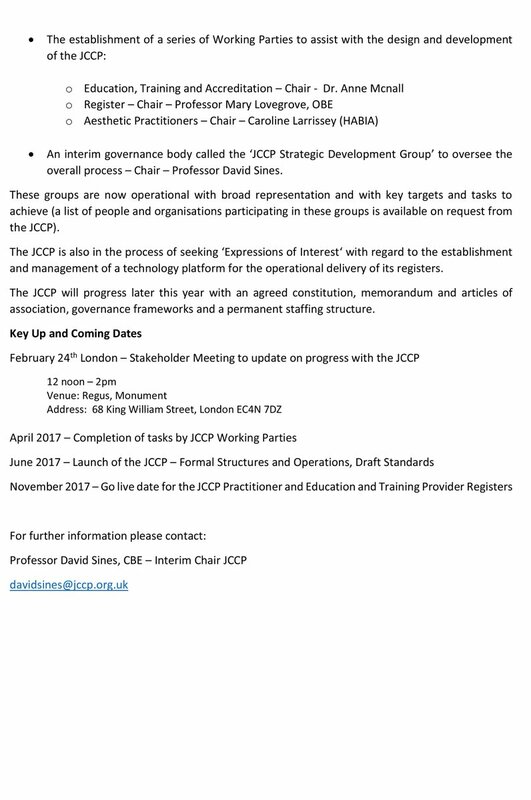 The JCCP will progress later this year with an agreed constitution, memorandum and articles of association, governance frameworks and a permanent staffing structure. Please click on the images below to read the full statement.